Due to the recent increase in the number of visa applications and the Consular affair procedures, our waiting room is crowded and the waiting time could be longer. Furthermore, it might be difficult to make an appointment to schedule a visit to apply for a visa at the moment. If it is urgent or your departure day from Sydney is coming up soon, but you cannot make an appointment, please call us for further assistance. To apply for a visa, the applicant must make an appointment online in advance to visit our office. The available time for a visit will be morning only from 9:30 to 12:00.
passport. Booking is NOT needed for a collection. Please make sure to take a “Visa Collection (VC001)” ticket from the ticket machine for the collection. Image of the ticket machine screen - Press “Collection” then “Visa” (NOT “Passport”). we must ask to take a new ticket of “Visa Collection”. Please make sure to get a “VC00x" ticket. 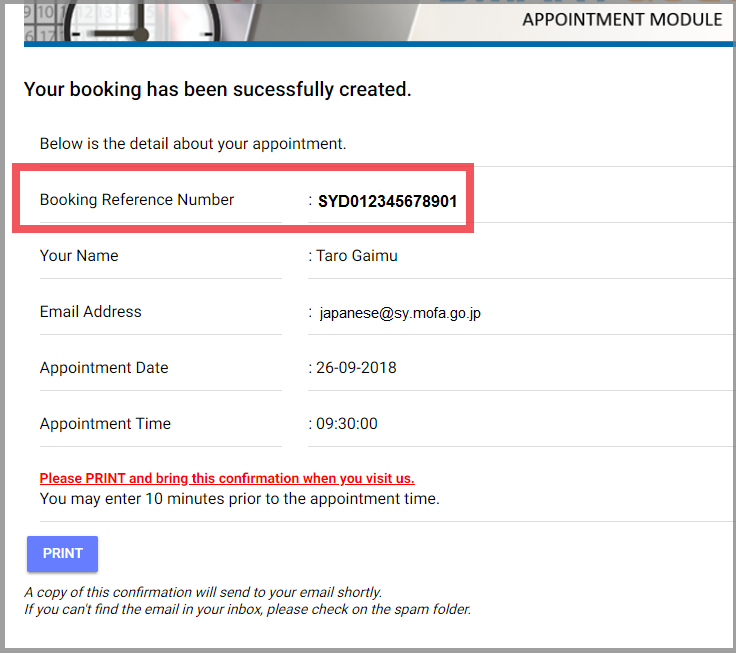 In order to reduce waiting times, the Consulate-General of Japan in Sydney has introduced an online booking system for all Visa applicants. All visa applicants now must book their appointments online in advance to schedule a suitable date and time to visit the consulate to apply for a visa. information in the next page after hitting "VISA APPLICATION" button at the bottom. 1)	Complete ALL visa application documents required to be submitted to the consulate. 2)	Book visa application appointment online. 3)	Receive confirmation email with booking code. the consulate on the date of your appointment. 5)	Arrive at least 10 minutes prior to your appointment time. 6)	Check-in by inputting printed booking code into ticket machine. An appointment booking can be made 1 day to 3months in advance to visit , and you may apply for a visa 3months prior to entering Japan. Depending on your travel plan, please apply for a visa accordingly. When the booking is completed, the booking details including the booking reference code "SYD00000000000" will be displayed promptly on the screen (recommend taking a screenshot or save it), and also the confirmation email will be sent to the nominated email address. When you visit our office, the booking code will be required to input into the ticket machine to check-in, so please make sure to bring the printed appointment confirmation with you as you must switch off your mobile phone or other electrical devices. Before making a booking, please check that you have completed all the documents and ensure you bring them to the Consulate on the date of your appointment. Incomplete require documents will not be processed and the applicant must make another appointment to visit again. - You cannot make a duplicate appointment. - Family members or couples who live together can make 1 booking if you travel and apply together. yet including a baby has to come to collect his/her passport when the assessment is completed. - You cannot make an appointment for a visit on the day (1 day to 3 months in advance). per time and there is no guarantee that a slot will always be available for an applicant's first choice. - You may check-in 10 minutes prior to your appointment time. - If you are late 30 minutes from the appointment time, the booking will be canceled. Visa Application (how to apply) or Visa Collection (after assessment).